Earlier this summer, projekt202 hosted a panel discussion that sparked such great conversation, we are planning a bigger and better sequel at Seattle Interactive Conference (Oct. 18-19). For the Seattle conference, we have our eyes on the evolution of UX and related fields like Customer Experience Strategy and Human-Centered Design. Before we get ahead of ourselves, it would be helpful to put the October panel in context. Let’s step back to review the July panel that got us so fired up for Seattle Interactive. Our intention behind the first panel was to look at what is driving the rapid evolution of UX research, strategy and design. We invited some of Seattle’s technology and business thought leaders, including moderator Jennifer Carlson, Executive Director of Washington Technology Industry Association (WTIA) Workforce Institute and an Adjunct Professor at Seattle University; Donna Andrews, Senior UX Designer at Honeywell Scanning and Mobility; Susan Motte, Principal UX Researcher at Expedia and Principal at Breeze Design Research; Rob Pierry, Chief Technology Officer at projekt202; Liz Sanocki, Director and Senior Lecturer in Human Centered Design and Engineering (HCDE) at the University of Washington; and Tira Schwartz, Principal User Experience Researcher at Redfin. 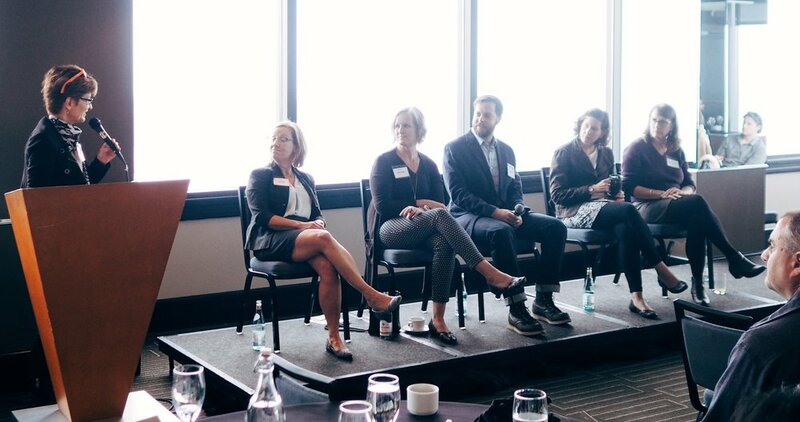 projekt202’s Seattle General Manager Polly Hopkins welcomes “Designing Software for People” panelists Liz Sanocki, Susan Motte, Rob Pierry, Tira Schwartz and Donna Andrews. We began with a straightforward question: What is the business imperative to “designing software for people”? Generative research relies heavily on observation of end users in context -- at home, at work, on mobile devices, etc. -- to reveal their wants and needs. By mapping all of the ways they engage with your product or business, we can generate ideal customer experiences. It is not an academic exercise or an expensive consulting add-on, as many fast-to-market clients misunderstand it to be. The takeaway for us at projekt202 was that today’s highly competitive environment demands that we understand how human-centered design is evolving. Our methodology could be the deciding factor in opening new sources of revenue for our clients, as well as creating customers and employees who are loyal brand advocates. That’s why we’re diving in deep at the Seattle Interactive Conference with an expanded panel and our eyes on the future of UX. This time our leading question will be, What Big Ideas do you see impacting the evolution of design and UX? The Maker movement, the Internet of Things, and the Built Environment are just a few of the trends we see as sources of inspiration for our work and our clients. Tracking cutting-edge movements is important because designing software for people is what we do best at projekt202. But it also means balancing two competing objectives. On the one hand, many clients come to us with the business objective to energize brand awareness and drive revenue with a revolutionary UX solution. The emphasis is on financials, market performance, forecasting and real-time decision making. On the other hand, projekt202’s multi-faceted, research-driven methodology begins and ends not with data, but with people – the end users who interact with the software we design on a daily basis. Our engineering and design objective is to build software that works well and is a pleasure to use. Looking for “what’s next” can help all of us bridge those competing objectives and deliver successful customer experiences. The evolution of UX is exciting. I hope you will join us at SIC Oct. 18-19 -- and be prepared to share your ideas about “what’s next” for UX research, strategy and design.